About the book: To say Tess Graham has a complicated relationship with her hometown is putting it mildly. With family ties and a successful real estate business she’s built from the ground up, Tess doesn’t want to leave. Not really. She would, however, like someone to see her for who she really is rather than the overshadowed twin in one of the town’s most prominent families. If only she could make a name for herself and find her place in Cobble Creek. My review: I LOVED everything about this cute romance! 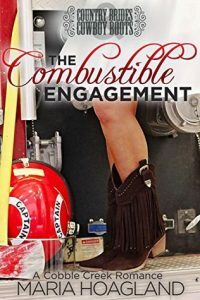 I loved the characters, I loved the plot, I loved the idea of a firefighter coming to town, and a pretend engagement? That really is the best!